I had driven northwest out of Blythe the night before, about 22mi to the end of the pavement along Midland Rd. The defunct mining town at the end of the road is signed for private property and there is at least one full-time resident. I camped outside the signed area and in the morning was greeted by barking dogs that had come out to investigate this intruder. I had hoped to drive a mile or two in along the dirt road to do some peaks on the east end of the Little Maria Mtns, but decided against that approach when the dogs arrived. Instead, I went to the pass on dirt Rice-Midland Rd about a mile away. This well-graded road goes all the way north to SR62, forking off Midland Rd just before the pavement ends. This would add some miles to my outing and keep me from getting to the second objective of the day on the east side of this pass, but it mattered little as I had a fine time wandering the desert and scrambling on a mix of good and bad volcanic and limestone rock. For the third day in a row, strong winds swept across the landscape, keeping things cool for much of the day. I wore a fleece for the first few hours, but after that it was sufficiently warm for just a tshirt. Sunrise came shortly after 6:30a, just as I was getting started from the pass. The first summit, unofficially named Midland Peak, is about 1.4mi west of the pass, the first mile relatively flat across the basin north of the Midland site. The south side of the range has been extensively prospected and heavily bulldozed to make roads all over the place. The climb up to Midland Peak from the southeast was steep class 2, nothing difficult, over mostly broken volcanic and limestone rock. Gordon and Barbara had left a register in 2003, without any other entries until my arrival. This would be replayed in similar fashion on the next two peaks. 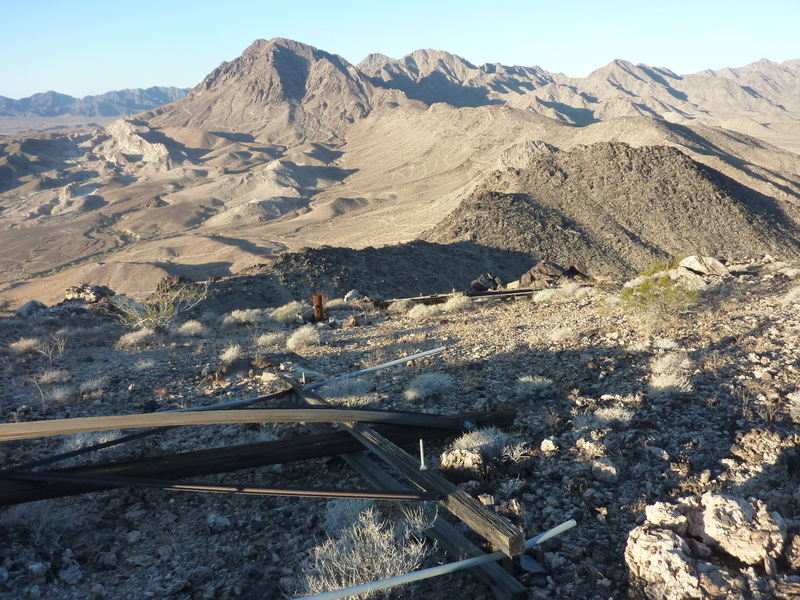 The summit of Midland Peak is littered with downed utility poles, a rusting mesh antenna, and other detritus forgotten now for decades. The route grows interesting after this as I followed on or near the crest for about 3mi. Some of it was a bit spicey and took some care to stay safe. During this time I started receiving texts from various friends and family wishing me a happy birthday. It was a bit absurd, stopping every five or ten minutes to answer one of these, but it was nice to be remembered (even by my children!) and nice to have cell reception out in this remote range. It took me over two hours to reach the next summit, Peak 2,709ft about two miles away. This, too had a MacLeod/Lilley register, though much older - from 1987. A second page listed earlier recorded ascents between 1947 and 1983. I'd guess most of those were employees from the open pit Brown Mine at the peak's base to the east when the mine was operating. I had to drop almost 600ft as I continued northwest along the crest to Peak 2,732ft, less than 25ft higher. This third summit is a P1K, however, and my primary objective for the day and the reason I picked this outing. The descent off Peak 2,709ft involved some minor class 3 while the ascent to the last peak was class 2, taking a little over an hour to traverse between the two. The register I found here had been left by John Vitz in 2006. Looking northwest, the range highpoint was still another 4.5mi away with other interesting summits in-between, but this was as far as I would go today - time to head back.